Compaq - SMART ARRAY 431 1CH PCI ULTRA3 SCSI CTRL 16MB. P/N: 127695-B21 OR 143886-001. Compaq - 264030-B21 HP/COMPAQ - SMART ARRAY 5I PLUS ULTRA3 SCSI RAID CONTROLLER CARD FOR DL380R G2 WITH 64MB CACHE (264030-B21). NEW BULK. IN STOCK. SHIP SAME DAY. Hewlett Packard - 405160-B21 HP/COMPAQ - SMART ARRAY P400 8CHANNEL LOW PROFILE PCI-E SERIAL ATTACHED SCSI RAID CONTROLLER WITH 256MB CACHE (405160-B21). NEW BULK. IN STOCK. SHIP SAME DAY. Hewlett Packard - 447029-001 HP/COMPAQ - SMART ARRAY P400 8CHANNEL LOW PROFILE PCI-E SERIAL ATTACHED SCSI RAID CONTROLLER (447029-001). NEW BULK. IN STOCK. SHIP SAME DAY. Hewlett Packard - 405132-B21 HP/COMPAQ - SMART ARRAY P400 8CHANNEL PCI-E SERIAL ATTACHED SCSI RAID CONTROLLER WITH 256MB CACHE (405132-B21). NEW BULK. IN STOCK. SHIP SAME DAY. 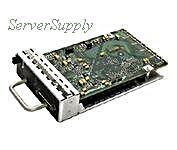 Hewlett Packard - 287484-B21 HP/COMPAQ - STORAGEWORKS SINGLE CHANNEL ULTRA320 SCSI I/O MODULE FOR MODULAR SMART ARRAY30 (287484-B21). NEW BULK. IN STOCK. SHIP SAME DAY. Hewlett Packard - 504022-001 HP/COMPAQ - SMART ARRAY P400 8CHANNEL LOW PROFILE PCI-E SERIAL ATTACHED SCSI RAID CONTROLLER (504022-001). NEW BULK. IN STOCK. SHIP SAME DAY. Hewlett Packard - 238633-B21 HP/COMPAQ - SMART ARRAY 5312 64BIT 133MHZ PCI-X ULTRA3 SCSI RAID CONTROLLER WITH 128MB CACHE (238633-B21). NEW BULK. IN STOCK. SHIP SAME DAY..
Hewlett Packard - 305415-001 HP/COMPAQ - SMART ARRAY 642 DUAL CHANNEL 64BIT 133MHZ PCI-X ULTRA320 SCSI RAID CONTROLLER CARD. (CARD ONLY). (305415-001). NEW BULK. IN STOCK. SHIP SAME DAY. Hewlett Packard - 273914-B21 HP/COMPAQ - SMART ARRAY 6404 4CHANNEL 64BIT 133MHZ PCI-X ULTRA320 SCSI CONTROLLER WITH 256MB CACHE (2INT VHDCI68) (273914-B21). NEW BULK. IN STOCK. SHIP SAME DAY. Hewlett Packard - P3475-69002 HP/COMPAQ - NETRAID 2M DUAL CHANNEL PCI ULTRA160 SCSI LVD/SE ARRAY CONTROLLER WITH 128MB CACHE (P3475-69002). IN STOCK. SHIP SAME DAY. Hewlett Packard - 405162-B21 HP/COMPAQ - SMART ARRAY P400 8CHANNEL PCI-E X8 SERIAL ATTACHED SCSI (SAS) RAID CONTROLLER WITH 512MB BBWC (405162-B21). NEW BULK. IN STOCK. SHIP SAME DAY. Compaq - 283551-B21 HP/COMPAQ - SMART ARRAY 5304 64BIT 66MHZ PCI ULTRA160 SCSI RAID CONTROLLER WITH 256MB CACHE (283551-B21). NEW BULK. IN STOCK. SHIP SAME DAY. 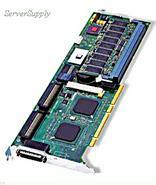 Compaq - COMPAQ 3100 ES SMART ARRAY SCSI 3 CONTROLLER 3 CHANNELS. P/N: 295570-B21 OR 295625-001.